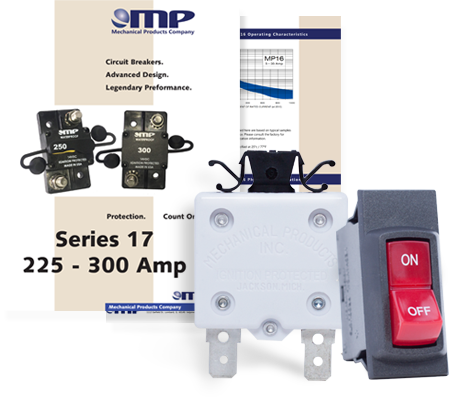 Mechanical Products (MP) today announced the release of another family of circuit protectors, the Shortstop Series 32. Available in ratings from 3 to 50 Amps, the NEW Series 32 offers an auto, manual, and modified reset and is a single pole thermal circuit breaker. Short Stop circuit breakers are available in three mounting styles: Standard right angle mounting bracket, parallel mounting bracket, and without a mounting bracket. 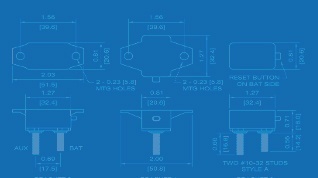 They have a standard #10-32 threaded termination style. This series can be protected from the elements through the use of the sealing boot available in both red and black. These boots offer protection against short circuits, as well as from dirt, dust, and splash resistance. Type I and II models have a rated voltage of 12VDC Max. Type III have a rated voltage of 24VDC Max. All models have an Interrupt Capacity of 2500A at 12 VDC and a dielectric strength of 1500VAC. They comply with SAE Standard J553 & J1171, are IP66 rated (with plastic cover), and are ROHS compliant. 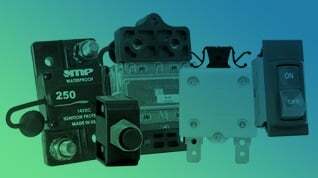 The MP Series 32 Shortstop circuit breakers are designed for various applications: Battery charges, Trucks, Buses, RV’s & Motorhomes, Electric Vehicles, Trolling motors and more!